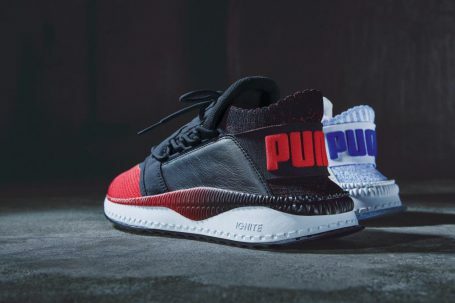 Global Sports Brand PUMA introduce the TSUGI Shinsei Nido – the latest drop to hit the streets in two fresh new colourways, taking inspirational cues from traditional Japanese color symbolism – blue represents purity and cleanliness, while red exemplifies energy, vitality, and power. The hero colourway of the pack is the fresh new offering in Toreador Red and PUMA Black. Featuring a stand out red mesh vamp the all-new TSUGI Shinsei Nido is completed with rich black leather overlays and top section, sitting on a faded red to black midsole. The secondary colourway comes in Lapis Blue and PUMA White for a contrasting yet striking look. The first sneaker to drop in the TSUGI range was the TSUGI Shinsei, pushing design to the next level with a unique new style combined with all-new tooling and sole unit. Always forging the way in offering alternative closure systems to the market, the TSUGI Shinsei features a unique lacing concept for a progressive look and extra comfortable fit. Instores starting August 15 in Europe, followed by September 1 in the US.